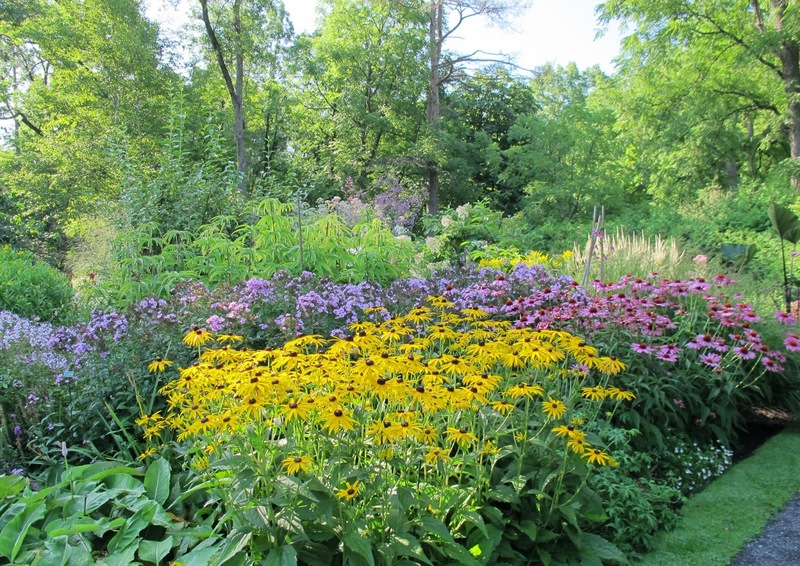 Reading "Tell About Night Flowers"
I returned to my garden late yesterday afternoon after being away for almost a week at the Garden Writers Association symposium in Quebec City. I brought back with me hundreds of photos of gardens and plants. Would you like to see them all? I'm sure you would. Well, all in due time. Patience. 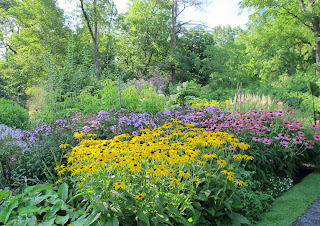 I'm sure that my photos from the many public and private gardens we visited will make their way to my blog eventually. Or perhaps they'll show up in a presentation? While in Quebec City, I started to read another book, Tell About Night Flowers: Eudora Welty's Gardening Letters 1940 - 1949 selected and edited by Julia Eichelberger (2013, University Press of Mississippi). I love books of letters, so what could be better than a book of letters about gardening? It turns out nothing could be better, at least for me at this time. "I was born with the feeling that if time and hurry were forgotten, something quiet and wonderful would happen in their place." Just think about that for a minute. No hurry, take your time. Let it soak in. "The delphiniums I planted in my ignorance have all bloomed like everything and are getting ready to bloom for the second time and Mother says the ladies of the garden club come over each day to worship and grit their teeth." I never had much luck growing delphiniums so I would be one of those who went to Welty's garden to both worship and grit my teeth. After all, isn't that how we sometimes feel when we see a garden and love it. We fawn all over it but at the same time we are gritting our teeth at the very idea that someone could make a garden so lovely, and why can't I do that? I felt that way just a tiny bit about the gardens in Quebec City. Everything there seems to bloom at once. I would guess this is because the growing season in Zone 3b is primarily June 1 - October 1, so everything has to happen more or less at the same time. Some of the borders made me worship and grit my teeth. Admiration and envy. This, of course, reminds me of another quote from Tell About Night Flowers. I can't find it in the book, but Welty ended it by calling some spider lilies nitwits because when transplanted to a northern garden, they bloomed at the same time as those in her southern garden. She felt they should have bloomed later, so called them nitwits for not figuring out they weren't in the south anymore. I don't normally write in books but I may start writing in this book so I can find the quotes again. Or maybe I'll keep a big stack of note cards by my side when I read so I can jot down the page numbers and a few key words for my favorite quotes. Tell About Night Flowers was the perfect book to read for the six days I was in Quebec City. 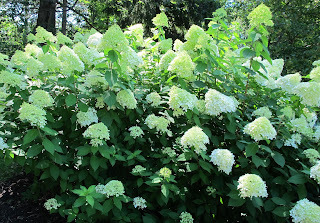 It allowed me to totally immerse myself in gardens, gardening, and garden writing. Did I mention a couple of the selected letters mention one of my favorite garden writers, Elizabeth Lawrence? 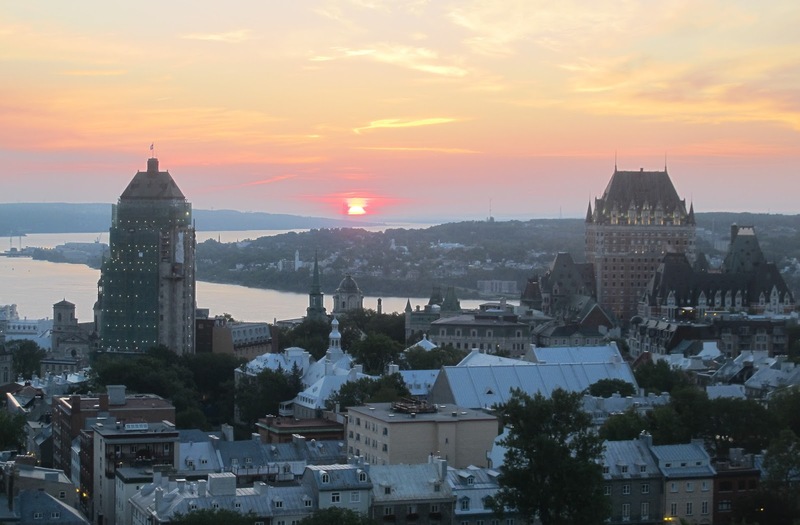 Each day I would read a bit of the book as the sun rose over the St. Lawrence River. Then I could carry those thoughts with me through beautiful gardens. Each evening, I ended the day filling my head with more gardening letters from Welty. Now that I'm home, I'm continuing to savor the letters in the quiet of the end of the day, with pencil in hand to mark the passages that I want to remember. Tell About Night Flowers. Five stars. It is like delphiniums to me. I have ordered this book because of your love for it, Carol. I can't wait to fill my head with gardening thoughts, too. I love the idea of using notecards to document favorite passages from books! I often use a highlighter pen to mark in the book. The sunrise over the river looks like a perfect way to start a day! What a sunrise. Love the quotes. Nitwits indeed! The Quebec Conference sounds wonderful and so does the book of Welty's letters. I have a book, One Writer's Garden: Eudora Welty's Home Place, by local (to me) author Jane Roy Brown about the renovation of Welty's garden. It is a beautiful book with tons of fascinating information that also plants the seed of visiting that garden someday, and imagining Eudora among the delphiniums.